Trauma care at Boston Medical Center has long been recognized as a resource by the professional community and everyday citizenry. Dating back to our predecessor institution Boston City Hospital, we have created a legacy of excellence in trauma care. Our reputation for state of the art trauma care is what attracts clinical expertise to join us in providing high quality care and that instills comfort and confidence to patients and families that they will receive exceptional care every day. 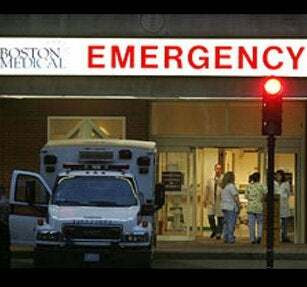 With the busiest Emergency Department in New England and the full range of clinical services, there is very little that we haven’t treated or can’t handle any time of the day or night. Acute Care Surgery has been a long-standing and integral component of the care at Boston Medical Center. The Sections of Acute Care & Trauma Surgery and Surgical Critical Care are flagship programs at the hospital and internationally recognized centers of excellence. Integrating principles of trauma surgery, emergency general surgery and surgical critical care, Acute Care Surgery provides both surgical intervention and ongoing care for patients with traumatic and emergent surgical issues. Acute Care & Trauma Surgery is staffed by eight full-time, dedicated trauma and critical care attending surgeons who are available 24 hours a day, seven days a week for urgent inpatient and elective outpatient consultations. This closed service is the only unit with practitioners who are exclusively dedicated to the management of acutely injured patients in the state of Massachusetts. The Sections of Acute Care & Trauma Surgery and Surgical Critical Care at Boston Medical Center is a flagship program of the Boston Medical Center and is internationally recognized as a center of excellence. Surgical Critical Care encompasses comprehensive care for critically ill surgical and trauma patients, all of whom have undergone highly complex surgical procedures or are being treated for severe illness, demand close monitoring, and require the highest level of care. The Surgical Intensive Care Unit (SICU) at Boston Medical Center is a state-of-the-art facility that includes monitored step down beds, staffed by critical care board-certified trauma surgeons, full-time nurse practitioners (seven days a week) and a nursing staff with an average of over twenty years of critical care experience. In addition, an attending intensivist is in-house 24 hours a day, seven days a week, providing oversight, assessment and management. Surgical Critical Care requires a high level of monitoring, continuous consultation and customized tailored plans of care for each patient. In addition to members of the Department of Surgery, this multidisciplinary approach brings together many subspecialty services as well as members of Case Management, Nursing, Nutrition, Pastoral Care, Patient Advocacy, Physical and Occupational Therapy, Rehabilitative Medicine, Speech-Language Pathology and Social Work. This multidisciplinary group meets regularly to ensure holistic and complete care for each patient and their family and provides optimal outcomes for all.